For virtual documents, do not manually change escape sequences in the data transformation; Ensemble handles these automatically. For information on adding other kinds of actions, see the next chapter. There are five kinds of assign actions: set, clear, remove, append, and insert. After you create any kind of assign action, you can change the type. To do so, select a different value in the Action drop-down in the Action tab. Ensemble represents each assign action with a connector line in the DTL diagram. If you assign from the top-level source object or any object property of another object as your source, the target receives a cloned copy of the object rather than the object itself. This prevents inadvertent sharing of object references and saves the effort of generating cloned objects yourself. If you instead want to share object references between source and target, you must assign from the source to an intermediate temporary variable, and then assign from that variable to the target. Drag the circle tab to the right of the source message. Hold down the mouse button. Drag the cursor to the triangle tab to the left of the target message until its box changes color. 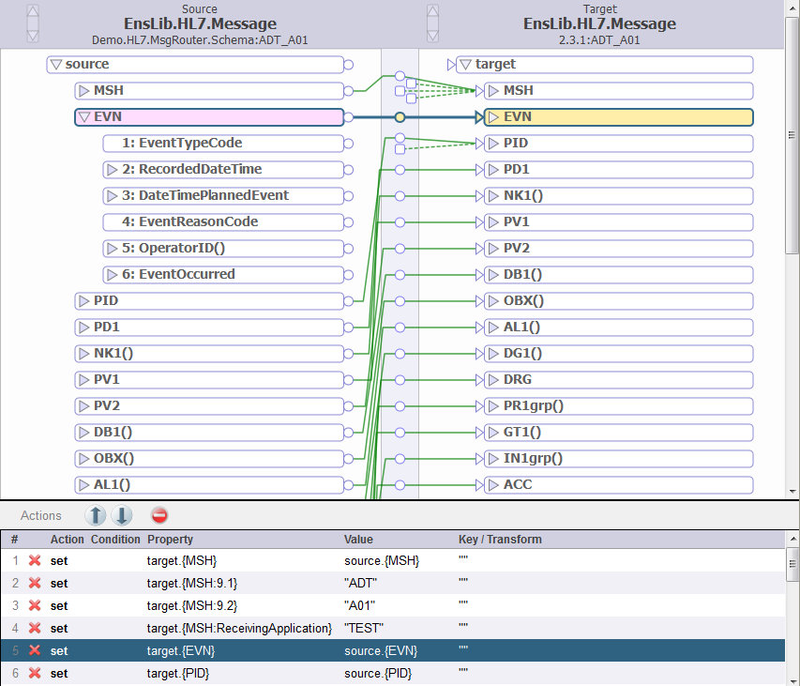 The table below the diagram now shows the details of the assign action. Optionally edit the details on the Action tab. This assign action uses set. 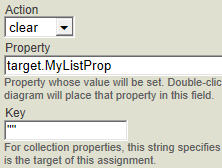 If parent properties in the source and target are identical and the source and target have the same type, you can assign the values of all the sub-properties at once. In this case there is no need to expand the parent properties to reveal the sub-properties. Simply drag the cursor from the parent property on the source side to the parent property on the target side. If the source and target types are different, such as transforming from an EnsLib.HL7.Message to an EnsLib.EDI.XML.Document, you cannot use this feature to assign subproperties, even if the structures appear to be parallel. For such a transformation, you must assign each leaf node of a structure independently and add a For Each action to process iterations. See Adding a For Each Action for details on the For Each action. Click set from the Add Action drop-down list. The Action tab for this operation displays. To create an expression that uses an Ensemble function, click the search button next to the Value field. 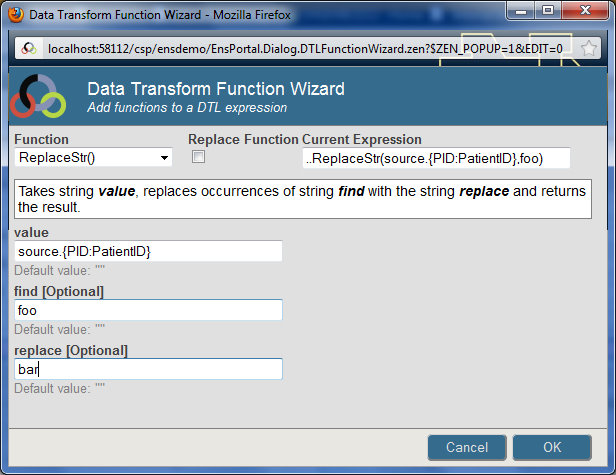 This invokes the Data Transform Function Wizard, which is described in the following subsection. To create a more complex expression, type the expression into the Value field. See Valid Expressions, earlier in this book. Make sure that the expression is valid in the scripting language you chose for the data transformation; see Specifying Transformation Details, earlier in this book. Select a Function from the drop-down list. More fields display as needed to define the expression. If you select Repeat Current Function from the drop-down list, a copy of the current function is inserted as a parameter of the itself, which creates a recursive call to the function. Edit the fields as needed. For instructions, see the context-sensitive help in the dialog. Click OK to save your changes and exit the wizard. 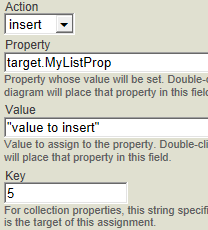 Collection properties in standard Ensemble messages. Repeating fields in Ensemble XML virtual documents. Select the target list property or array property. 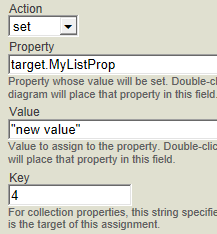 In the Property field, edit the value in parentheses so that it identifies the item to change. For array properties, use the key of the array item. 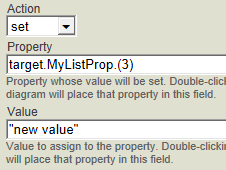 For list properties, use the index of the list item. For repeating fields in Ensemble virtual documents, use the index of the segment or field. Edit Value to contain a literal value or other valid expression. 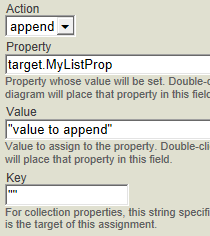 This section applies to list properties (but not array properties) in standard Ensemble messages. You can also use this action with XML virtual documents; see the Ensemble XML Virtual Document Development Guide. Click insert from the Add Action drop-down list. The Action tab for this operation displays. In the Property field, remove the trailing . (1) from the displayed value. For key, identify the index position for the new item. Click append from the Add Action drop-down list. The Action tab for this operation displays. 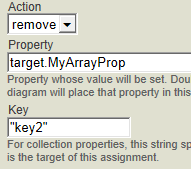 This section applies to collection properties (lists and arrays) in standard Ensemble messages. You can also use this action with XML virtual documents; see the Ensemble XML Virtual Document Development Guide. Click remove from the Add Action drop-down list. The Action tab for this operation displays. For key, identify the item to remove. Click clear from the Add Action drop-down list. The Action tab for this operation displays.